from a unique rhythmic perspective: at the crossroads of poetry and music. He is a Street Poet—Rock & Roll Poet—Hippy Poet. and retired from a 27 year career in Stage Production in Hollywood. that aired on television shows in the 1960s. Shebang (with host, Casey Kasem) and various other syndicated TV dance shows. (For more information, click on the Personal Links page). Steven currently lives in Eugene, Oregon. In retirement he pursues his second career of writing, performing and publishing the poetry that has poured out of him since he was a boy. for local poets, artists and musicians. and his continuing efforts to help other poets, artists and musicians. but more relevant now than ever! Click ﻿HERE﻿ for all the details. 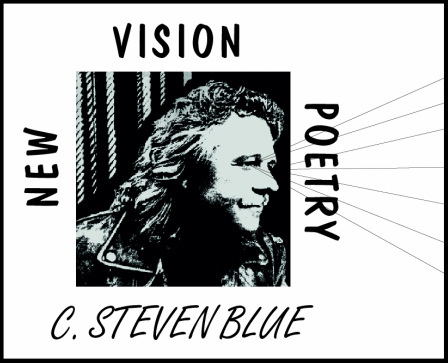 As a way of showing our thanks to C. Steven Blue's fans, you will find links to many extras on this website: Poems, live performances, artwork, history and more. Be sure to look around for many engaging surprises. ACTUALLY PUBLISHED AS A FACEBOOK PAGE !! A MULTI-MEDIA CYBERSPACE EXPERIENCE !! See it here: "The Perspetive View Of The Endless New"
The Poetry Stage 2015 videos are now ready for viewing. where it may provide inspiration and hope to those who need it the most. all told in verse format. Click the button for all the low down! Arrowcloud Press has several opportunities for Volunteers, Interns & Part-Time Help.